Sarah tries to help a family on Skynet's kill list. The old transit bus Derek walks past at 0:09 on the Blu-ray is a 1992 TMC RTS. In the "six months earlier" scenes, Lauren is wearing a t-shirt that says "Get a Grip". Above the Fields' fireplace mantel is an oar imprinted with "First Place River Run 2003"; a framed photo beneath it shows that it was apparently won by David. As Sarah and Cameron introduce themselves to the Fields', Sarah is holding her Glock 17 and Cameron a Remington 870 shotgun. The Fields' dog is named Charles Barkley. Charles Barkley is a former American professional basketball player and now an analyst on the TNT post-game show Inside the NBA. That's pretty good for a dog. The family van driven by Sarah at 4:11 on the Blu-ray is a 2001 Chevrolet Venture. It must the Fields family vehicle as it has not been seen previously. The license plate is California 2SAQ321, which appeared previously on another vehicle in "Gnothi Seauton" (and will be seen again in "Desert Cantos") and has been seen in a number of TV shows and movies. Lauren remarks that Sarah is well beyond help by Dr. Phil. Dr. Phil (Dr. Phil McGraw) is a psychologist and television personality with his own daytime talk show, Dr. Phil. He is not a dog. The pick-up truck driven by the Terminator that rams the Chevy Venture is a 1994 Ford F-150. Lauren wears a St. Jude's medal that had been her grandmother's. St. Jude was one of the Twelve Apostles of Jesus Christ. In Roman Catholicism, he is considered the patron saint of lost causes. Also not a dog. Lauren tells Derek that her father "emptied the Mossberg" into the Terminator that was chasing them. Mossberg is an American firearms manufacturer, specializing in shotguns. Major General Perry, seen in this episode, also appeared in Timeline TT-1 in Dawn of Fate (where his first name is stated to be Justin) and is mentioned in Timeline G-1 in Genisys. After David is found to have a broken leg after the run-in with the Terminator, Sarah breaks his "First Place River Run 2003" oar in half over her knee to make a splint. It seems unlikely she would be able to break an oar in half that way! Possibly, the award was not a real oar and was made of cheap, fragile wood. At 11:54 on the Blu-ray, a large mug is seen on the workbench shelf of the Fields' garage with the phrase "World's Greatest Dad" on it. A box of Champion spark plugs is seen at 12:03. The two camp lanterns seen on the workbench appear to be Coleman brand. Lauren informs Sarah that her father is not a banker as he claims, but works for Syndyne Cybernetics. This is a fictitious company. Eagle Rock Bunker is a resistance outpost seen in the future. It is also seen in Timeline S-1 in Faith. Eagle Rock is a relatively affluent neighborhood of Los Angles. In Derek's memory of the future war reconnaissance of the Eagle Rock Bunker, he carries a Westinghouse M95A1 Phased Plasma Rifle. Jesse also carries one in this scene. In Derek's memory of the future war, Jesse tells him that she and the crew of the nuclear Seawolf sub Jimmy Carter have been making troop and supply runs from Perth for months. The Jimmy Carter is an actual U.S. Navy submarine of that class, launched in 2004 and named for the 39th President of the United States. Perth is a city on the west coast of Australia. Anne refers to her husband David as a hophead. This is a slang term for "drug addict". Possibly, he is taking pain-killers for the bulging L4 disc in his spine that he mentioned earlier. In his memories of the future, Derek remarks to Sydney and Jesse that Terminators switch to infrared at nightfall. 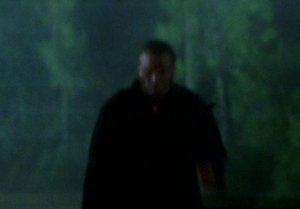 In Timeline S-1, in Salvation, Kyle also remarks on the Terminators having infrared capability (though in The Terminator, his older self told Sarah the opposite, that humans mostly come out at night to avoid being spotted). At 32:51 on the Blu-ray, a small satellite dish stored on a shelf in the background is seen to be a DirecTV dish. Jesse tells Derek that rabbits were introduced to Australia in the 1800s and the country's been overrun with them ever since. Actually, the invasive species was introduced there in the 1700s. The rest of the story she tells about them is accurate. Jesse refers to her country as Oz at one point in her rabbit discussion. Oz is a popular nickname for Australia. Cameron kills Roger, apparently not realizing he was human. But wouldn't her robotic senses tell her he's human? At 35:44 on the Blu-ray, Cameron, David, and Lauren show up in Sarah's Jeep Liberty, seen in a couple of previous episodes. As the T-888 chases the Jeep down the road, a red light can be seen emitting from it's throat. The Terminator is somewhat damaged, with skin torn, exposing the metal endoskeleton underneath. But what is the red light? Near the end of the episode, at the Serrano Point resistance base, we see that the same type of hazard suits are in use there as were seen at "present day" Serrano Point in "Automatic For the People". In Derek's memories of the future, Jesse, fighting a losing battle against the disease alongside him, says, "You know what Oscar Wilde's last words were? 'Either the wallpaper goes, or I do'". Oscar Wilde (1854-1900) was an Irish writer of fiction, plays, and poetry. From what I can find, his actual "wallpaper" quote (and they were not his last words) was, "My wallpaper and I are fighting a duel to the death. One of us has got to go." What happened to the T-888 that was pursuing the Fields'? Derek's phone call with Sarah at the end of the episode suggests that they took care of it somehow, but the resolution is not shown. Last we see, the T-888 is losing ground in its pursuit of the Jeep.